and former model Rande Gerber. 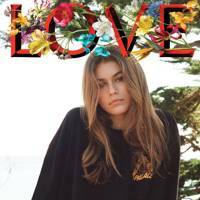 The youngest of Crawford and Gerber's two children, Kaia's first modelling job was with Versace at the age of ten - Donatella Versace even commented at the time on Crawford Jr.'s "very special gift". 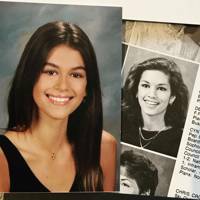 However, it wasn't until the end of 2014 when it was revealed that she was following in her famous mother's footsteps and modeling in Teen Vogue that she garnered the media's attention. Signed to IMG models, Kaia made her runway debut for Raf Simons' Calvin Klein Collection in 2017 and has worked with various fashion houses including Marc Jacobs, Burberry, Alexander Wang, Coach, Prada, Chanel, Fendi and Moschino. 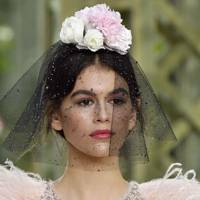 She landed her first solo Vogue cover in February 2018 as cover star for Vogue Paris. She appears in Spring/Summer 2018 campaigns for Versace, Calvin Klein, Marc Jacobs and Omega. Like most models these days, Gerber is thought to have set her sights on acting as well. Speaking about the appeal of the theatrical arts, she has been quoted as saying: "I like to explore beyond who I am so I can feel for other people... When you become someone else, you better understand others." Cannot. Compete. With. This. Beaut. But we *will* copy her hairstyles. "You could say I'm a fan of hers, and I would love to see her succeed."